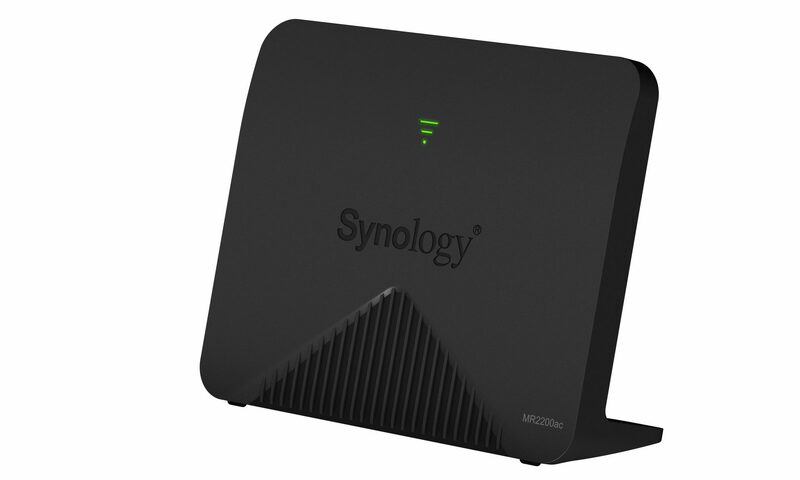 SINGAPORE – December 17, 2018 – Synology Inc. today launched its first mesh router, the MR2200ac, which supports Wi-Fi Protected Access (WPA3) and is intended to empower homeowners with fast, uninterrupted Wi-Fi while giving them the ability to understand, control, and secure their entire network. A high-performance wireless router with a modular design, the MR2200ac provides coverage that can be easily expanded with additional units to create a mesh network for connected homes of all sizes. Based on the Qualcomm® IPQ4019 quad-core system-on-chip, MR2200ac leverages a tri-band Wi-Fi design to eliminate dead zones and deliver Wi-Fi to the farthest corners of the house. Everything in the network is managed by Synology Router Manager (SRM), an award-winning operating system that has made many business-grade features accessible to consumers through an intuitive user interface. Intelligent mesh technology: MR2200ac dynamically chooses the best route (2.4GHz, 5GHz or Ethernet) for communication between each MR2200ac and with client devices, designed to always give you the fastest possible path to the Internet. Enhanced roaming experience: comprehensive support for standards including 802.11 k, v, and r enables you to move from one place to another more seamlessly. Easy setup: select which MR2200ac you want to add from a browser or the DS router mobile app, and watch as the network automatically self-configures and self-optimizes before your eyes. Works with Synology RT2600ac: allows offices to extend the coverage of the powerful Synology RT2600ac router even farther. The latest SRM 1.2 release also comes with a brand-new Safe Access package that brings together best-in-class parental controls and automatic security at the network level, so that you don’t have to look for separate solutions for each individual platform. Create a kid-friendly online world: set up user profiles, decide when and for how many hours they can use the Internet, and protect them from adult-only content with web filters and SafeSearch. Web filters can be scheduled to limit a teenager’s social media usage to specific hours. For younger ones, put together a white list of approved websites for them to access. Understand how kids are exploring the Internet: see when they’re online, which devices they’re using, and if they accidentally stumble on inappropriate websites. Children can submits request for parents to unblock websites if needed. Through such interactions, parents can ensure that they can stay involved at every step of their child’s digital journey. Network profiles for family gadgets and IoT devices: decide on policies to determine how devices can connect to local or guest networks, which also ensures that abnormal activities are prevented and logged. Silently securing your perimeter: DNS and IP threat intelligence tools block access to malicious destinations in real-time, whereas the introduction of Google Safe Browsing to Synology routers extends Google’s protection against malware, social engineering, and unwanted software to the whole network. MR2200ac is one of the very first routers to be certified by WPA3, the newly-announced Wi-Fi security standard. With new options including WPA3-Personal, WPA3-Enterprise and Enhanced Open™, MR2200ac equips home, business, and public Wi-Fi networks with the latest defences against snooping and other attacks. Backed by Synology’s long track record of fast and continuous updates, your mesh network will stay ready to counter any emerging threat.